At a time when many regional organisations are struggling for funding, a hero has come forward to provide a lifeline to the Gascoyne Food Council. Farmer Jacks Supermarket’s Fred Fairthorne yesterday pledged $100,000 over four years to the group to enable it’s important work to continue. The Gascoyne Food Council is a producer organisation that provides stakeholder management, marketing and communication and promotional opportunities for the seafood, meat and fresh produce suppliers in the region. The Food Council also delivers the Gascoyne Food Festival. This is the second time that Farmer Jacks have come to the table for the region. In 2015 after Cyclone Olwyn, when there was so much damage and devastation, Fred also pledged $100,000. Food Council Chairman Michael Nixon says that words can’t describe how much this contribution means to everyone in the region. “Farmer Jacks support of our work and contribution to keep it going are incredibly important to us. It is not just the financial, but also the support of our goals and activities which inspires us to keep doing what we do,” Michael added. In his statement to the council Fred commented that he has always admired the incredible resilience and the innovation of the producers in Carnarvon. “It is a very special place for me, whether it is the water, the soil, the remoteness I can’t put my finger on it but the produce that comes from the region is incredible. The innovation and the technology that is being adopted by growers amazes me and the improvements in quality and new products that come from Carnarvon over the years are just better and better. 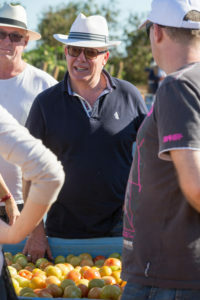 Since I began in this business the Carnarvon Industry has changed a lot and the innovation in products such as the incredible grapes, the Sweeter Banana product and the grower uptake in technology is fantastic, and, I see that Carnarvon can be the future of horticulture in WA,” said Fred. “My father used to say that necessity is the mother of invention, and the Gascoyne Food Council has shown that year after year, as they deliver incredible events such as these and those in Perth, with few resources but a lot of passion and dedication. That’s why today, I am making a commitment to provide $100,000 of funding to the Food Council over the next four years, to enable them to continue on with these important activities. I love the way that the Food Council and the region works together and Farmer Jacks wants to keep being a part of the exciting future that the Gascoyne Food Council is bringing about,” Fred said.